There's probably only one thing more special than owning your own yacht, and that's building one first. We work with a range of builders which include Lurssen, Heesen, Feadship, Nedship, Pearl and San Lorenzo. However we are also up to date with the yacht availability with most German, Dutch and Italian shipyards. We also have our flagship range of CALEDONIA YACHTS which are designed by Monaco based award winning architects Sterling Scott. Alternatively we work with a range of designers like Tony Castro, Christian Leyk and The A Group, in order to design to your specification. The first steps are to browse the various sections by using the list in our BUILD menu above, where you'll see examples from the various shipbuilders and designers. When you're ready to start the discussion, get in touch. Featured at the 2013 Monaco Yacht Show, this stunning 88m yacht is currently being enjoyed by it's owner around the world. Featuring 8 majestic staterooms all equipped and decorated with the most beautiful marbles, stone and exotic materials. There's a massive gymnasium designed by Usain Bolt, a huge swimming pool, helicopter pad, an expansive spa with hairdressing salon, two guest jacuzzis and a private massage room. Luxury motor yacht Linda Lou was built in 2006 by German shipyard Lurssen Yachts. With a steel hull and aluminium superstructure, she features exterior design by Espen Oeino and the interior work of Francois Zuretti. This twin screw yacht measures 60 metres and can accommodate up to 12 guests. Octopus is a 414 foot (126 m) yacht with two helicopters on the top deck and a 63-foot (19 m) tender docked in the transom. There are a total of seven tenders aboard. The yacht also has a pool, located on one of her upper decks, and two submarines. Known as Project Crystal by her builder, this 124 metre yacht’s name was unveiled as Katara upon her launch and spent her first full season in the Caribbean. She has one helipad and carries both her tenders and her SOLAS rescue boats in davits port and starboard. The yacht Carinthia VII was built in the Lürssen Yachts yard in 2002 and refurbished in the same yard 3 years later. Manufactured in steel, with an aluminium superstructure, Carinthia VII has a length of 318.25 ft (97.20 m), beam of 52.50 ft (16.00 m), draft of 15.75 ft (4.80 m), and a tonnage of 3,643 GT. 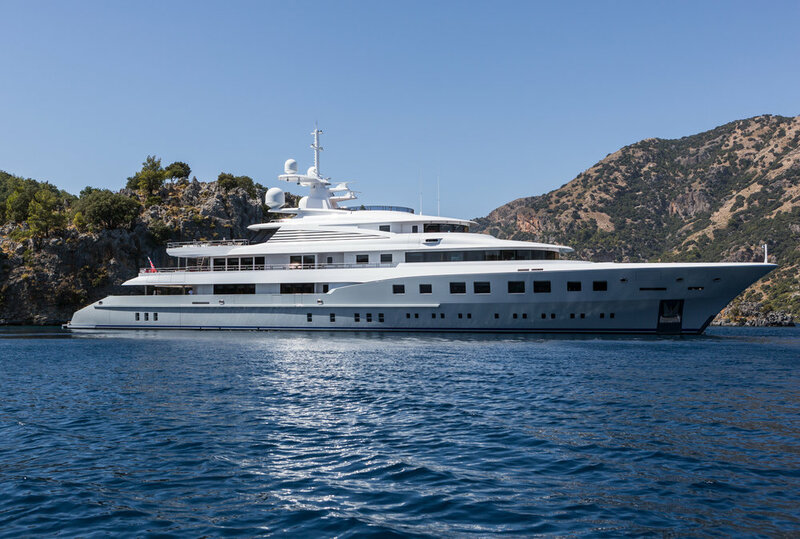 Launched in 2011 by the Lurssen Shipyard, the 200 Ft. (61m) LADY KATHRYN V features spacious accommodations for 12 guests in 6 ensuite staterooms as well as comfortable and elegant interior living spaces and ample outdoor dining and deck space. The 85 metre Pacific launched in 2010 from the Lürssen shipyard. The unusual exterior styling of the yacht comes from the drawing board of the Argentinean naval architect German Frers, who is known primarily for sailing yachts, while the interior of Pacific was created by Bannenberg & Rowell Design of London. Large glass panels surround the owner’s suite which has a very private area forward. Northern Star is a 75.4m motor yacht built by Lurssen in 2009. She was designed by Espen Oeino with a voluminous interior by British designer Pauline Nunns. The 'country house' style interior comfortably accommodates 12 guests in six staterooms and there is room for as many as 26 crew. Dilbar is a motor yacht built in 2008 by Lürssen. Her dimensions are 110.00 m (360.89 ft) long and a beam of 16.00 m (52.49 ft). Dilbar was designed by Tim Heywood to a specification that includes one helipad and the interiors are by Alberto Pinto.